This question arose when I was watching Krillin vs Jackie Chun who is Master Roshi. When Yamcha pulls the hair thinking it is a wig, but it won't come off, then he thinks it is real hair and asks that then the bald one should be a wig? Please, could anyone explain? There is a very detailed explanation in the second movie of Dragon Ball "the sleeping princess". minute 6:40. Krillin arrives. Goku tells him he's bold. 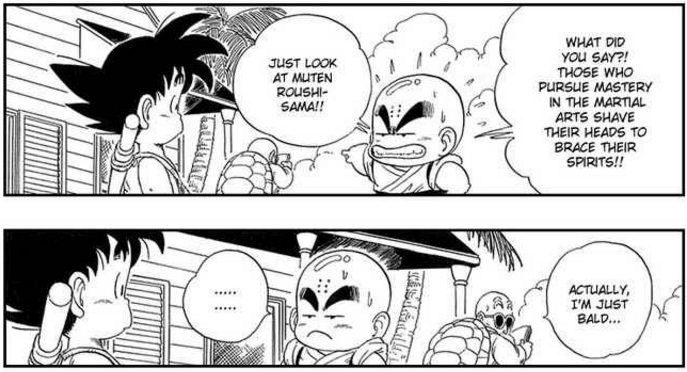 Krillin says all great Martial Artists shave, just like Master Roshi. Master Roshi says he's simply bald, nothing else.